Shennecossett Yacht Club in Groton, CT is sponsoring a unique regatta this summer on August 2. The inaugural SYC Lighthouse Regatta is an Eastern Connecticut Sailing Association sanctioned circuit race. Weather permitting, the plan is to have six racing classes sent on a 14-mile course up and down Fishers Island Sound. The course will encompass three lighthouses – New London Ledge (pictured), North Dumpling, and Latimer’s Reef – with views of six more lighthouses, making for an exciting navigator’s race. Fishers Island Sound is unique in its concentration of nine historic lighthouses in a relatively small area. They range in age from the New London Harbor Lighthouse, constructed in 1801 to the Avery Point Lighthouse that was constructed in the 1940s. An illustrated handout about the nine lighthouses will be created for the regatta. 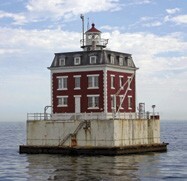 SYC will donate profits from the regatta to the New London Maritime Society Lighthouse Fund. The society is a non-profit organization showcasing New London’s maritime history and dedicated to the education about and preservation of local lighthouses. Any sailboat racer interested in more information can contact Gene Fiese of Shennecossett Yacht Club at fiese@sbcglobal.net. The club’s website is syc-ct.com.